How would you like to organize your garage? 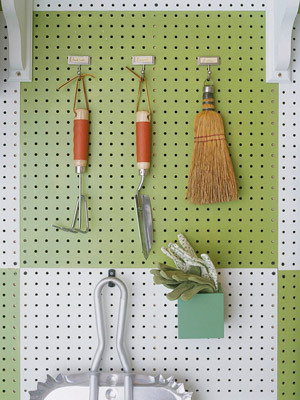 This storage helpers easily screw into place, providing stable homes for favorite trowels and other tools. Garden gloves are stashed in a colorful pencil caddy to keep them at the ready. I really like this idea. It's pretty neat! cute at neat tingnan.. dapat talaga may sarili ka na house para mapaganda.. dream ko yan..
naa mi garage diri sis pero wala mi sakyanan... nyahahah! Pretty cool!Magugustuhan nyan ni hubby ko--that if we have our own garage lol!